I know that this is the latest hot trend, but I’ve been canning things for what seems like forever. When I was little, we had a big pear tree in our yard, and so late summer was spent canning all manner of delicious pear-ish things. 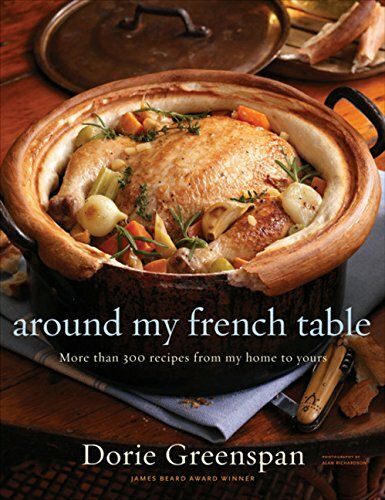 Pear Honey (still a favorite), canned pears, creame-de-menth pears… Lots of work, but lots of fun too. 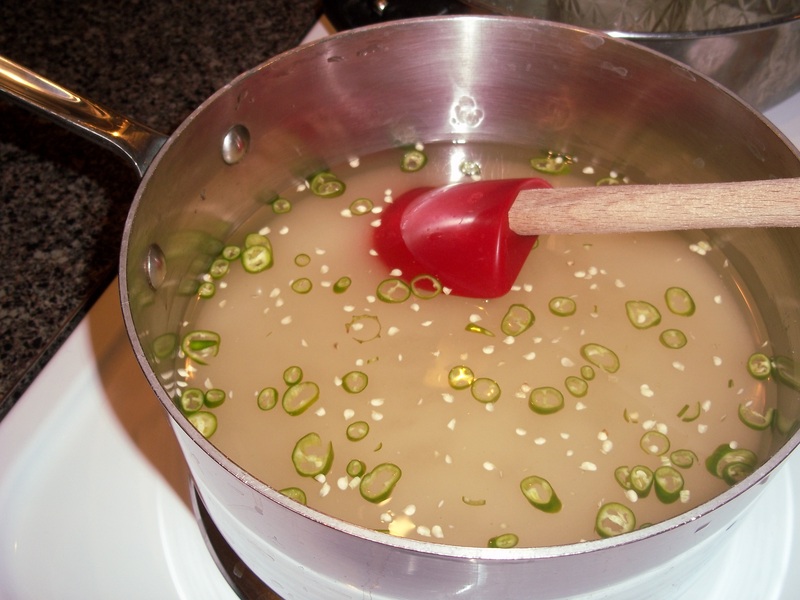 Later on when we moved to Arizona, we started making jalapeno pepper jelly. Since then, I’ve kept up the practice, though often moving farther afield as my tastes, interest, and supplies changed, and well, I had people giving me wonderful fruits to use! A few years ago, while living in Texas, I discovered Cinnamon Basil. It quickly became my favorite basil type – wonderful used in many things, particularly in Asian dishes. And then I came across a recipe for Fresh Herb Jellies in a great book (Fancy Pantry by Helen Witty). 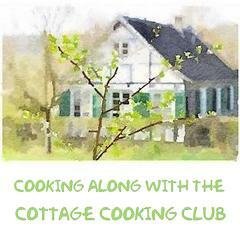 So the first time I made basil jelly, I used my cinnamon basil – and a new friendship was formed! Over the years, I’ve done a lot of canning, with the intent of sharing the fruits of my labors with friends and family. Today, I even have friends whos kids come home at the holidays and ask “what’s in Candy’s basket of goodies?”. Who knew? Of course, when my own adult foray into canning became more a part of my summer, there was always strawberry jam. And apple chutney. And of course, pepper jelly. And while I still make those things from time to time, one of my new signatures is Habanero Peach. Another is Drunken Fig… you can see where I’m going here. So this year, with another bounty of figs from a great friend, Drunken Fig has made another appearance. Plus (as I’ve written about before), I have access to wonderful sweet corn in the summer. My mom has been pining (yes, pining!!) 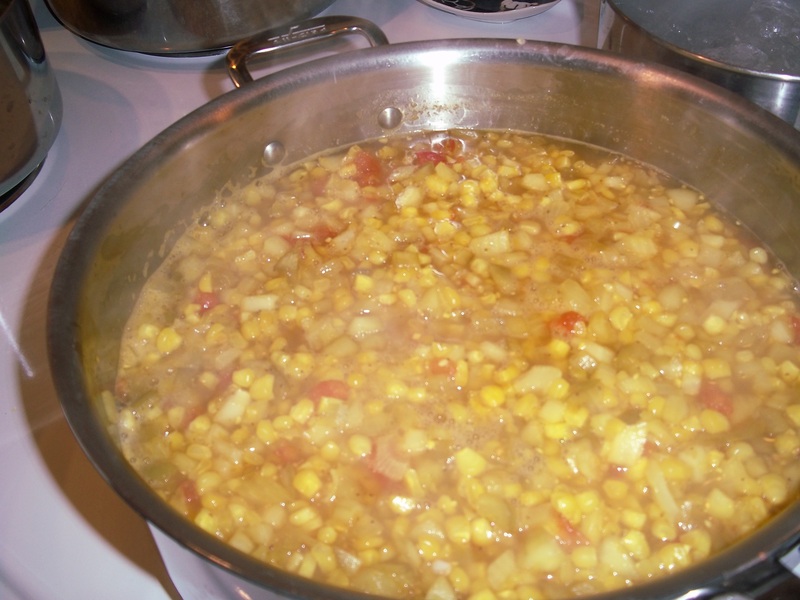 for corn relish for a couple of years – so that got the nod. This departure more of a throw-back, but totally worth the effort! Whenever I can find cinnamon basil plants, it must be grown. Down here, I have some, but it’s still struggling. Up north, it flourishes. And I have the advantage of having people around who say – “but what do I do with it?” So I made a batch of cinnamon basil jelly. 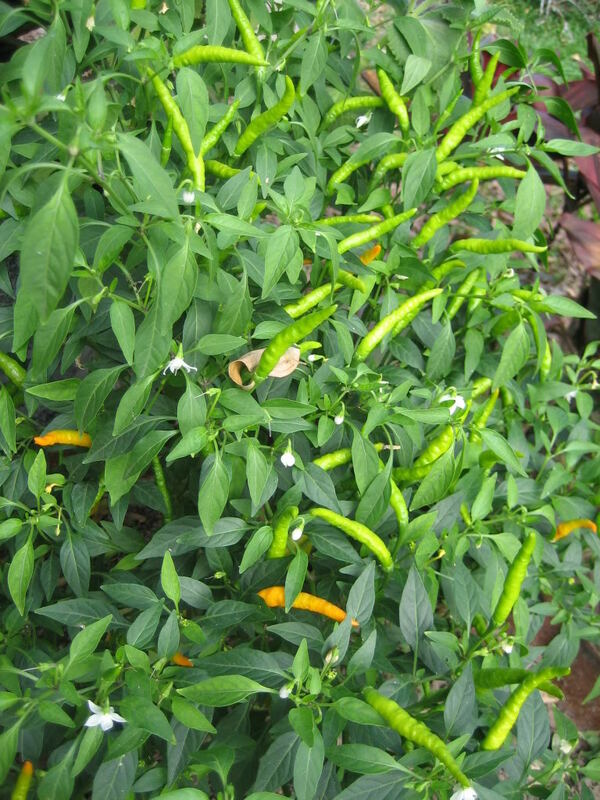 But, as summer wore on, one of the chile plants turned out to be a Thai Chile plant. Thai Chiles - well, not mine, but you get the idea! What to do? Of course, the two (yes, only two) chiles could be used in stir-fry or curry, but I started thinking… what about making some Thai basil pepper jelly? So, I gathered up some more cinnamon basil, adding some Asian basil to the mix, grabbed the two Thai chiles, and some lemongrass leaves. Maybe a new classic? Crush the leaves and stems together to break them up a bit (the original recipe said to chop them in a processor, but not too finely so that you don’t end up with a cloudy jelly). Put into a stainless saucepan and add the water. If you have a lot of leaves, don’t worry – you can add more water and I’ll give you a hint about how to use it later. You are really trying to make an herb infusion. Bring to a boil, and then remove from heat. Let steep, covered, for about 15 minutes – again, I’m not overly fussy about this step. I want a really flavorful infusion. If you don’t chop the leaves, you can simply strain the infusion into a measuring container. If you’ve chopped them, you may want to pour it through a couple of layers of cheesecloth. While the herbs are steeping, very thinly slice the chiles across the grain, keeping the seeds. (Do Not touch your eyes or anything else sensitive after you do this, or use gloves.) Set aside. 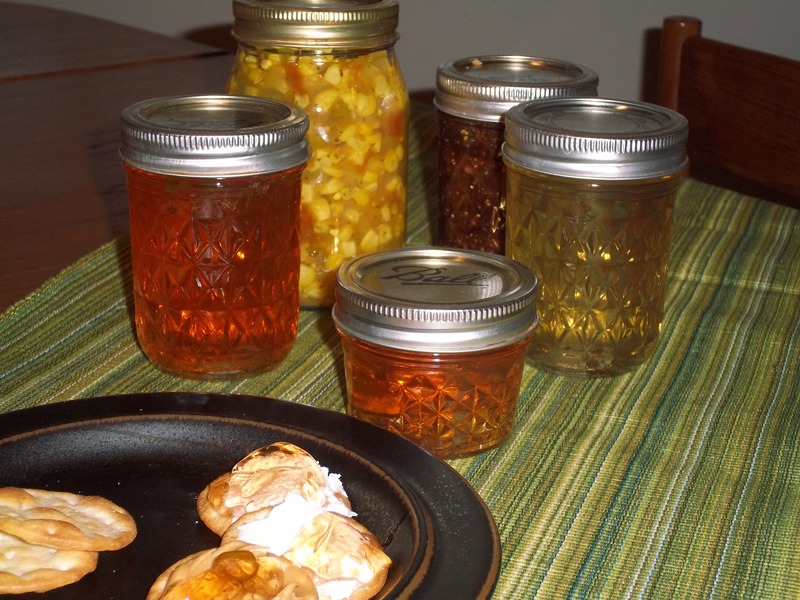 Prepare your jars and canning materials if you are planning on canning the jelly. If you plan to use it yourself shortly, you can simply refrigerate it. You will get about 4 half-pints or 2 pints – both with a little left over for a treat for yourself! Measure 1-3/4 c of the water and add into a clean stainless saucepan. 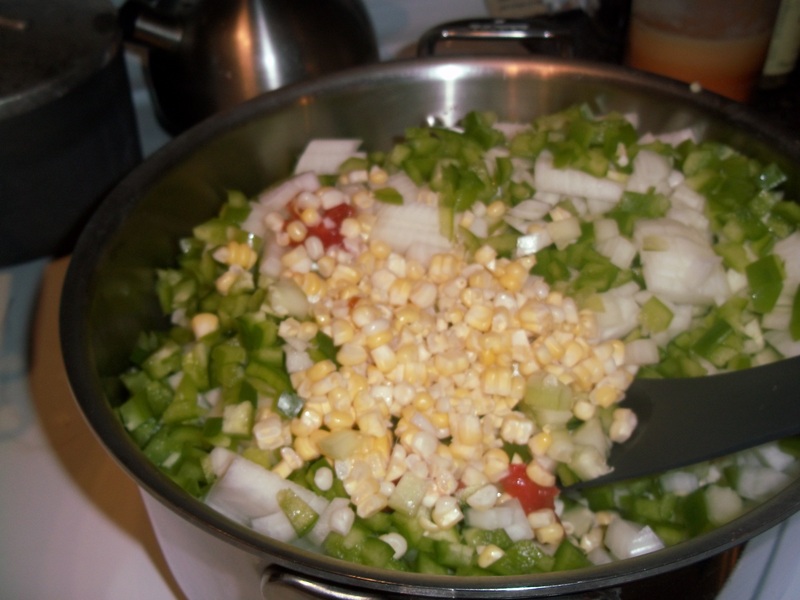 Add the sugar, chiles and vinegar and bring to a full, rolling boil (you cannot stir it down). Stir in the pectin and then bring back to the full rolling boil, and boil for exactly 1 minute. Remove from heat. Stir in 1 each drop of yellow and red food coloring (the regular basil jelly is kind of light, light peachy-green, this ends up being a little non-descript without color – though you could certainly pick something different, or not add any coloring at all). Skim off any foam if it forms. Put into jars, and process (if you are planning on actually canning). Allow to cool. The jelly will set within about 24 hours. So now, you ask… what do you do with this stuff? Well, the regular jelly is surprisingly good on toast – particularly rye toast. Who knew? That’s one of the great things about sharing, as people tell you how they use things. Toasted bagels, another good choice. I also really like any of these jellies with some cold chicken, or use as a glaze for some grilled salmon… of course, you can also have it as a topping with cream cheese and crackers. But the one thing that I came up with for this particular jelly? Peanut Butter! Yes. 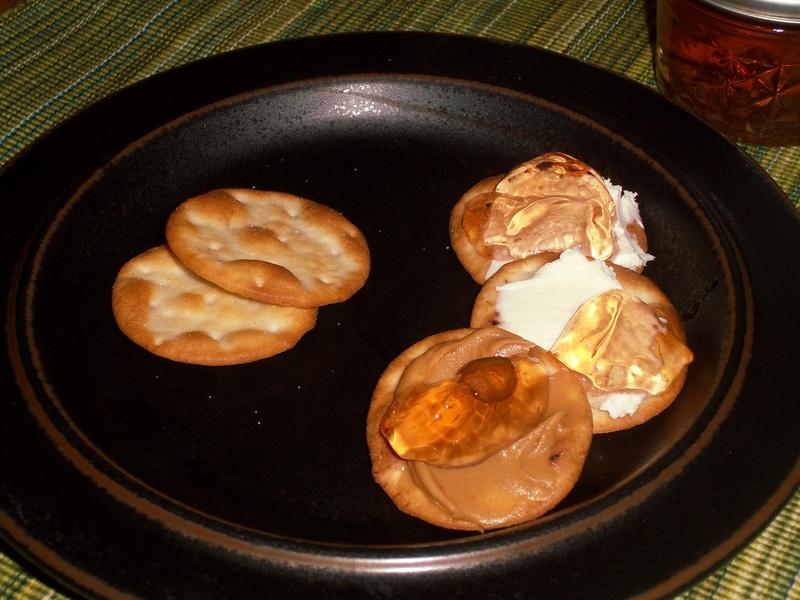 Kind of elevates a PB&J! yes, there's peanut butter there! Hopefully you’ll get inspired to try something. It’s a lot of fun. And so nice to bring out something home-made for family and friends. Oh, and if you need a little treat for yourself too!! Oh, and if you have leftover herb infusion… use it for rice in your rice cooker! OH MY! Maybe worth making the infusion just for the rice… amazing!!! I actually came to your blog to see your FFwD post, but I saw this and immediately had to look at the post. I’ve heard of pepper jellies, but this sounds sooo good. I’ve never seen or heard of cinnamon basil, but it sounds so interesting. This is a great post! Oh, and your FFwD looked great too!